Located on the northern border of Mount Seymour Provincial Park, highest point on the divide between Seymour Water Reservoir and Indian Arm. The original ascent was by Fred Mills and a large BCMC party via a boat up Indian Arm and then up Bishop Creek. 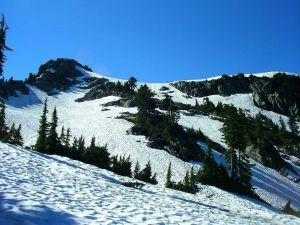 Despite being close to vancouver, it was seldom climbed more than once or twice a year after that, although with the recent trails up from Seymour River, ascents are more frequent. As of 2006, it is still very likely you would have the peak all to yourself, although there may be 8 or 10 ascents a year. Name Notes: Named after Joseph Charles Bishop, the first president of the British Columbia Mountaineering Club (BCMC). Joseph Bishop was killed in the early 1900's on Mount Baker.